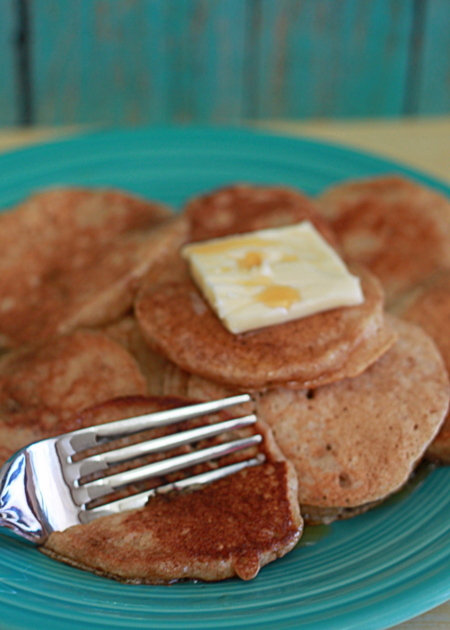 Tiny, tasty whole wheat buttermilk pancakes sure to satisfy any appetite, small or large. Now that our baby has been eating solids for a couple of months, we’re able to more confidently give her a hunk of bagel, a big broccoli floret, or a section of pancake to munch on all on by herself. So when my guy suggested whipping up a couple of pint-sized pancakes especially for her at breakfast time, it immediately took me back to my own childhood. 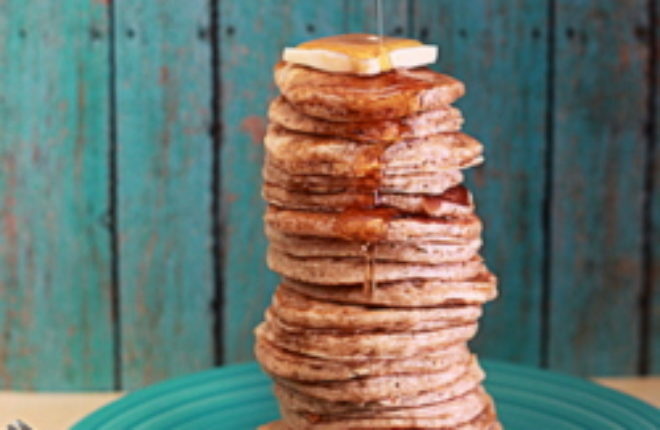 As a kid, I thought silver dollar pancakes – little 2-inch pancakes named such because their diminutive size resembles that of a silver dollar – were the most awesomely freakin’ cool breakfast pretty much ever. I wasn’t even really sure why I remembered them as being soooo fantastically awesome. Maybe it was because they would always have silver dollar pancakes at the roadside restaurants on our summer car trips to Yellowstone Park or Disneyland. Maybe it was because I thought I was cool because I could say I ate 15 pancakes for breakfast. Maybe it was because I could stack them a mile high and pretend I was King Kong. I didn’t ever really do that last one, I don’t think. Gosh, I really hope I didn’t ever do that last one. But as soon as I pulled the first dozen or so tiny little pancakes off of the griddle, I started to feel, well, almost a little giddy. And then I realized this: I remembered silver dollar pancakes as being fantastically awesome because silver dollar pancakes are fantastically awesome. This particular version is a riff on my favorite buttermilk pancake recipe, one which I adapted from the Joy of Cooking cookbook long ago. These are a slightly heartier version, made with whole wheat. That way, you can feel a little better about the dozen or more pancakes you just gobbled down for breakfast. The babe loved them too. “She ate $1.50!” my guy exclaimed. Looks like Short Stuff might just be on the way to thinking silver dollar pancakes are the most awesomely freakin’ cool breakfast ever, too. In a large bowl, whisk together the whole wheat flour, all-purpose flour, baking powder, baking soda, and nutmeg if using. In a medium bowl, whisk together the buttermilk, eggs, butter, and vanilla, beating until well-blended. Pour the wet ingredients over the dry ingredients and whisk just until incorporated. Heat a non-stick griddle to 350 degrees, or place a large non-stick frying pan over medium heat. Add a little butter, if desired, and scoop scant tablespoonfuls over the hot griddle/pan. Cook until the pancakes begin to look a little dry around the edges and start to form bubbles, about 1 minutes. Flip and cook for another minute until golden brown on both sides. 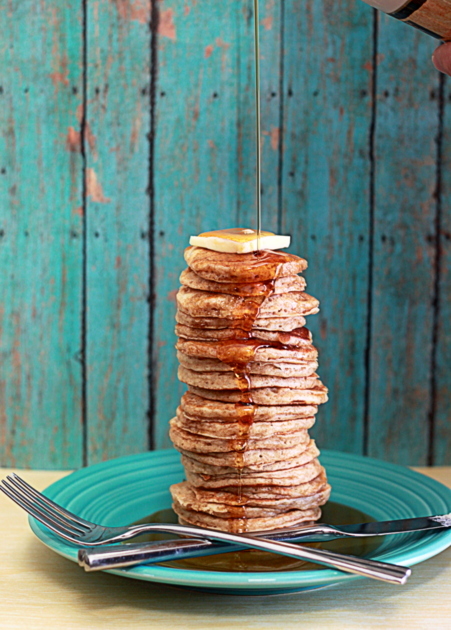 Could a stack of pancakes look anymore gorgeous? These are picture perfect. I could eat two platefuls! Thank you for sharing. Your blog is a treasure. I’m glad I found it! Thank you so much, Monet! 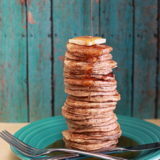 Growing up, I was obsessed with silver dollar pancakes! I haven’t had them in ages but I totally need to make these whole wheat ones! I love how you stacked all of them up too! Thanks! Weren’t they just the most awesome thing ever, as kids?! I loooooove this big tall awesome stack of pancakes. Fabulous food styling and I love the teal plank running vertically, making them look even higher! I notice all this stuff 🙂 In addition to the great recipe, of course. Is the plank real or just a poster-board surface? I have some ‘wallpaper’ made to look like wood but it’s not very convincing so I haven’t used it tons. Thanks so much, Averie! Umm … the “plank” is a 12×12 piece of scrapbook paper. 🙂 I desperately need to make some reliable (and decent-looking) portable wood backdrops but just haven’t yet found the time.